October 24, 1929 – October 29, 1929: Wall Street Crash of 1929: Three multi-digit percentage drops wipe out more than $30 billion from the New York Stock Exchange (3 times greater than the annual budget of the federal government). October 25, 1929: Former U.S. Interior Secretary Albert B. Fall is convicted of bribery for his role in the Teapot Dome scandal, becoming the first Presidential cabinet member to go to prison for actions in office. Map showing Senate party membership at the start of the 71st Congress. Senators were elected every two years, with one-third beginning new six-year terms with each Congress. Preceding the names in the list below are Senate class numbers, which indicate the cycle of their election. In this Congress, Class 1 meant their term began in this Congress, requiring reelection in 1934; Class 2 meant their term ended with this Congress, requiring reelection in 1930; and Class 3 meant their term began in the last Congress, requiring reelection in 1932. The names of members of the House of Representatives are preceded by their districts. 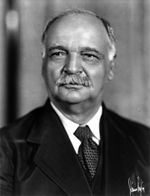 (3) Vacant Charles Curtis (R) had resigned at end of previous congress to become Vice President of the United States. (3) Vacant Sen.-elect William S. Vare (R) was apparently elected but vote was never certified by the Governor due to election irregularities. 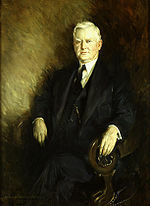 The Senate refused to qualify him and he was formally unseated December 9, 1929. Successor appointed December 11, 1929. (2) Lawrence Tyson (D) Died August 24, 1929. Successor appointed September 2, 1929, to continue the term. (3) Theodore E. Burton (R) Died October 28, 1929. Successor appointed November 5, 1929, to continue the term. (2) Walter E. Edge (R) Resigned November 21, 1929, to become U.S. Ambassador to France. Successor appointed November 30, 1929, to continue the term. (2) Francis E. Warren (R) Died November 24, 1929. Successor appointed December 5, 1929. (2) Frederic M. Sackett (R) Resigned January 9, 1930, to become U.S. Ambassador to Germany. Successor appointed January 11, 1930, to continue the term. (2) Patrick Joseph Sullivan (R) Interim appointee did not run to finish the term. (3) Henry J. Allen (R) Interim appointee lost election to finish the term. (2) John M. Robsion (R) Interim appointee lost election to finish the term. (3) Roscoe C. McCulloch (R) Interim appointee lost election to finish the term. (3) Joseph R. Grundy (R) Interim appointee lost nomination to finish the term. (2) David Baird, Jr. (R) Interim appointee did not run to finish the term. (3) Lee S. Overman (D) Died December 12, 1930. Successor appointed December 13, 1930, to continue the term. (1) Frank L. Greene (R) Died December 17, 1930. Successor appointed December 23, 1930, to continue the term. Lists of committees and their party leaders, for members (House and Senate) of the committees and their assignments, go into the Official Congressional Directory at the bottom of the article and click on the link, in the directory after the pages of terms of service, you will see the committees of the Senate, House (Standing with Subcommittees, Select and Special) and Joint and after the committee pages, you will see the House/Senate committee assignments in the directory, on the committees section of the House and Senate in the Official Congressional Directory, the committee's members on the first row on the left side shows the chairman of the committee and on the right side shows the ranking member of the committee. Byrd, Robert C. (October 1, 1993). Wolff, Wendy, ed. The Senate, 1789-1989: Historical Statistics, 1789-1992. United States Senate Historical Office (volume 4 Bicentennial ed.). Washington, D.C.: U.S. Government Printing Office. Official Congressional Directory for the 71st Congress, 1st Session. Official Congressional Directory for the 71st Congress, 2nd Session. Official Congressional Directory for the 71st Congress, 2nd Session (Revision). Official Congressional Directory for the 71st Congress, 3rd Session. Official Congressional Directory for the 71st Congress, 3rd Session (Revision).